We've been in talks with Tiny B's doctors over here and praying, writing emails, and finally celebrating...We are in the final countdown of The Feeding Tube. In three months if she is still growing and not using the tube at all, including taking all of her medication orally, it will be removed! This is a huge victory for our entire family. I had planned on doing fifteen of the twenty days of lessons for this month's Food and Fitness Mother Goose Time Curriculum, but life gets in the way, and I have only done ten of the days so far plus a lot of the Math and More and Literacy and More workbooks. I'm unsure if I'm going to do the last five days of lessons of if I am going to start the Desert theme right away. Today I'm going to look and figure out my plan. Ahhhhh this is why I love homeschool and I love transitional kindergarten/TK and Mother Goose Time. 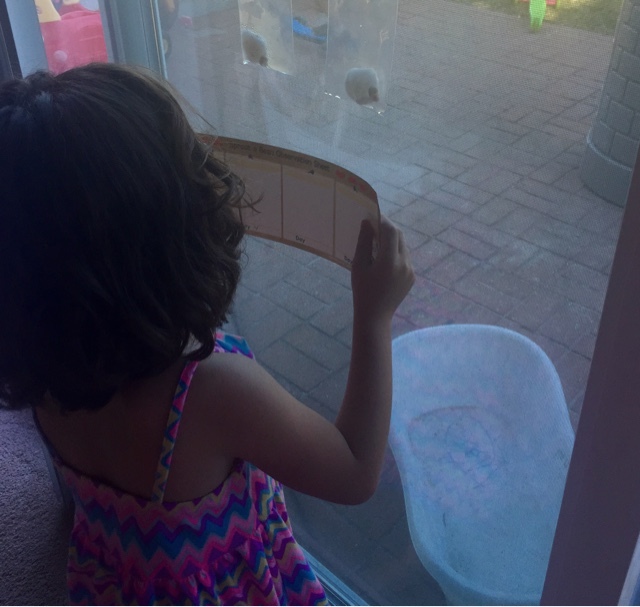 I want their education to be child-led at this point and our days filled to the brim with playing and wonder. Strong B has really taken to our very small backyard lately, looking for bugs and building forts. This, mixed with interactive activities and some book-learning for Tiny B, is what I consider to be the perfect education for my particular kiddos. 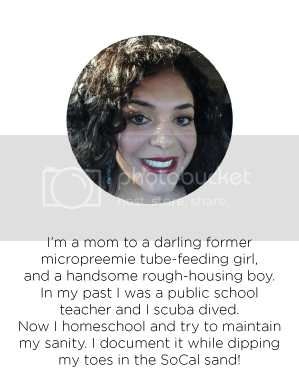 I'm going to take you through some of the activities in the first eight days of lessons so that you can see why she might have started internalizing some of the discoveries. For the anticipatory set (preparing them for the lessons) we went to the Farmer's Market. I gave them each a few dollars to spend. They both chose apples and ate them that week. 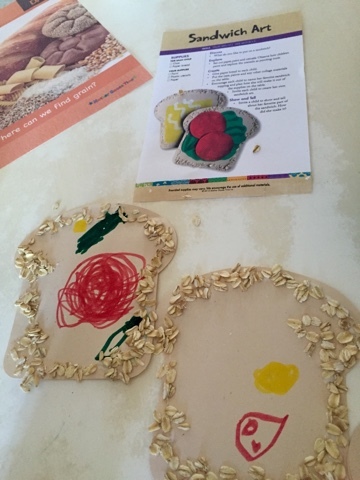 On Day 1 we learned about grains. They did "Grain Discovery" where they felt different grains and built their vocabulary with adjectives that described the grains such as soft, slick, sharp, etc. 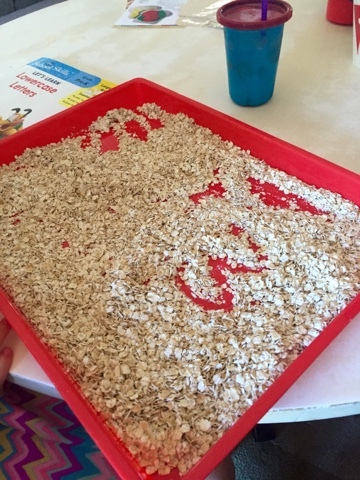 I extended this to having her draw letters in trays that I lined with dried oatmeal. 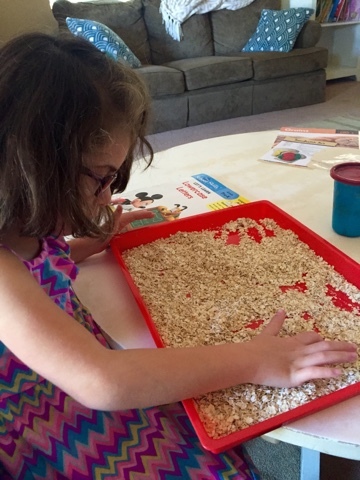 Her occupational therapist wants me to do a lot of sensory activities while learning to write her letters as opposed to only pencil and paper. It's easier and doing this using oatmeal or shaving cream or dirt, for example, is fun and builds up her hand muscles and the repetition is very beneficial so that it becomes more automatic. We did "Sandwich Art" and again practiced our fine motor skills while thinking about what we'd want on our most perfect sandwich. According to Tiny B who doesn't yet have the courage to eat a sandwhich, her most perfect sandwich would include eggs and broccoli. On Day 2 we learned about vegetables. I read them a book about vegetables (These books were from the library and I read one on each day) and Strong B was a lot more interested than Tiny B. 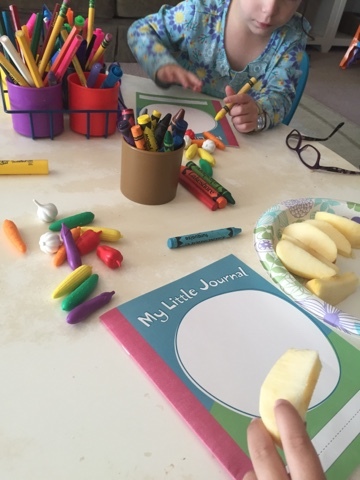 We drew a picture of ourselves eating our favorite food in "My Little Journal" and ate our apples from the farmer's market. I enjoy having Tiny B use a pencil in no-pressure activities such as drawing. 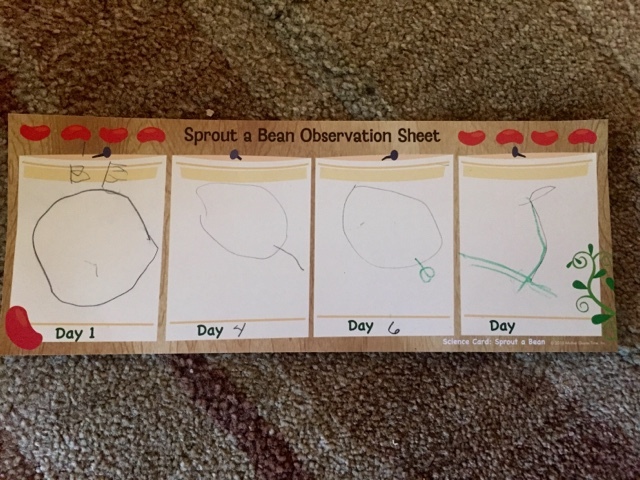 We also did "Sprout a Bean" using the Discover Science Card. 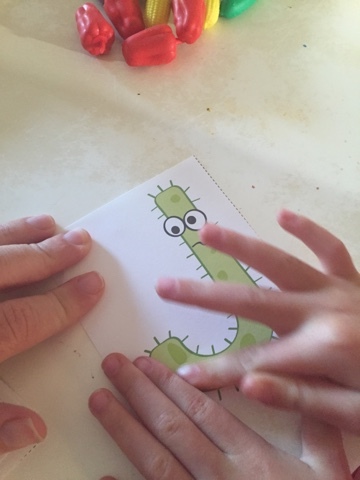 It gave easy directions in which the kids could follow the pictures and interpret what to do. We really enjoyed observing these over the coming weeks and discussed science words such as "observe" and "predict." I even threw in the word "hypothesis" and made them say it because it was so darn cute. On Day 3 we learned about fruits. It had been my goal for the month to do discuss the concept of the day during circle time and to sing the opening song to the tunes on the Circle Time CD. Today we sang "Let's Eat Fruit" to the tune of "Frere Jacques." I was able to meet my goal and used the Circle Time CD every day! 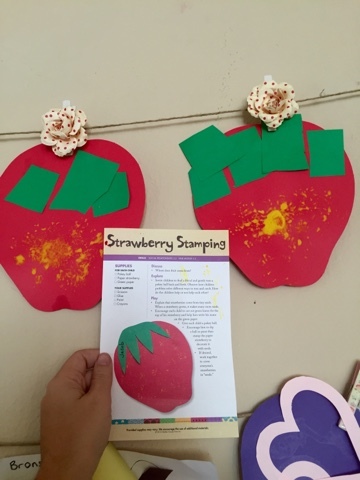 We did "Strawberry Stamping" and the kids enjoyed using the pokey balls to paint so much that we had to extend it to making a few more masterpieces on plain white paper. I love showing them that art doesn't have to include just using paintbrushes or pencil or crayon. I LOVE looking at the differences in their finished products! We also did a "Fruit Hunt" and looked through advertisements in the paper and tried to name the items and what food group they belonged to. Tiny B is a smart cookie, but her personal exposure to food has been so small that she really doesn't know many food items. It's so interesting. On Day 4 we did "Milk a Cow" which was adorable! First I showed them YouTube videos so that they could see what milking a cow actually looked like. 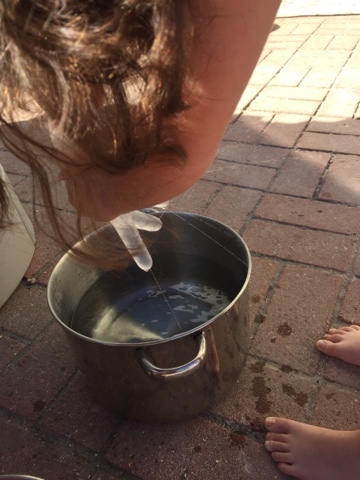 Then we poked hold in the vinyl glove which was included in this month's curriculum, and "milked a cow" outside. I'm not kidding you when I say that this evolved into hours of imaginative play. 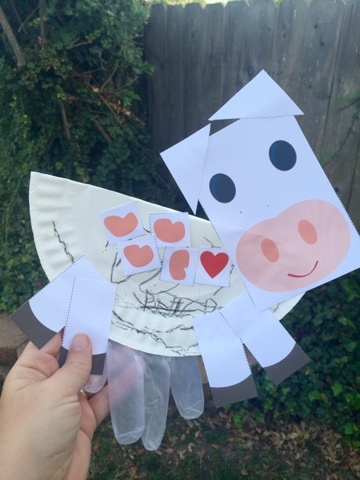 We had a lesson on "Parts of a Cow" and made the art activity. Isn't it absolutely adorable? Then we did the "Seek and Find Food" activity using the Theme Poster for the month. This lead to a great discussion on the different foods that should be represented on your plate. It's important to note that I made sure to tread very carefully with this discussion and the ones following it because Tiny B just isn't to the point yet of having all of the food groups on her plate at once. It's overwhelming and I don't want to pressure her. I will say that I believe that this is one of the activities that might have put some desire in her brain to start wanting to eat other foods. In the last week, she's added cookies, pancakes, and chicken nuggets to her repertoire, which is HUGE. Oh, and smoothies! How can I forget about that?? On Day 5 we learned about protein and played "Catching Fish" which had them pushing each other around the family room in a laundry basket and stringing paper fish into their pipe cleaner hook. 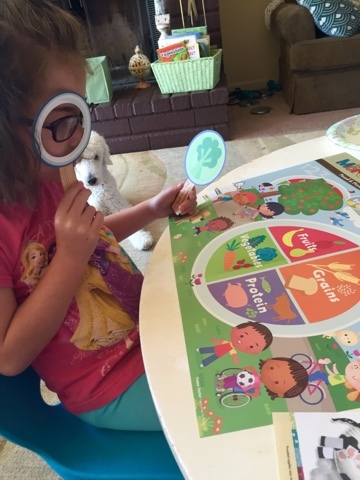 We also played the "Healthy Plate Game" which again involved discussion of food groups. On Day 6 we learned about Cleaning and Safety in the kitchen. I had them trace "food bacteria" with their fingers. Tiny B's occupational therapist was impressed with this one, as it's yet another way to learn letters without the pressure of a pencil! 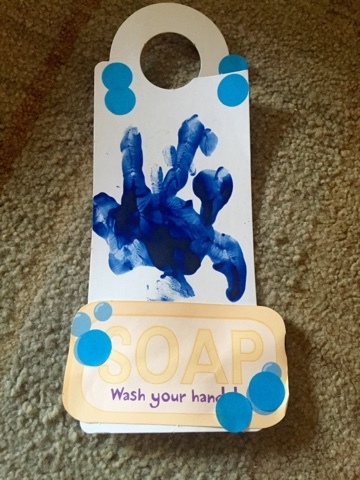 We made a "Hand Wash Hanger" and practiced washing our hands in the kitchen while singing "This is the way we wash our hands..." to the tune of "Mulberry Bush." I'm happy to say that the signs continue to hang in the bathroom and kitchen and Tiny B is quick to remind people of the germs that are everywhere and that they must follow the directions on the sign! We also used oven mitts in a game and practiced our knife skills using a banana (and then ate the banana of course). I didn't take any pictures of Day 7 which was about measuring and pouring. We set up a lemonade stand and Tiny B practiced her math and money skills with grandma. 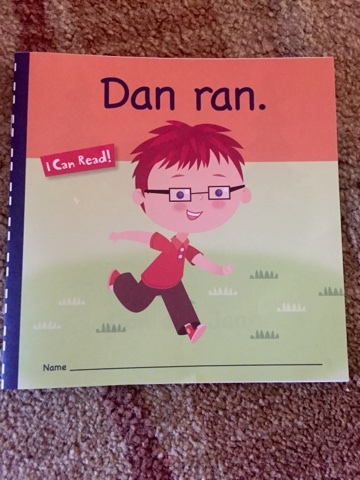 On Day 8 we "chopped and stirred" and read the I Can Read book called "Dan Ran" and worked on our sight words. This blog post has taken me two days to write amidst the craziness which is life with two young rascals, and in that time I've decided to extend Food and Fitness for one more week. We still have to talk about growth (this is a big one!) where I will show Tiny B her NICU videos and check-ups (Tiny B has experienced far too many of those!) and we need to work with our Geo Boards and make patterns with sports balls. Actually, it would be better if I could extend it another month! 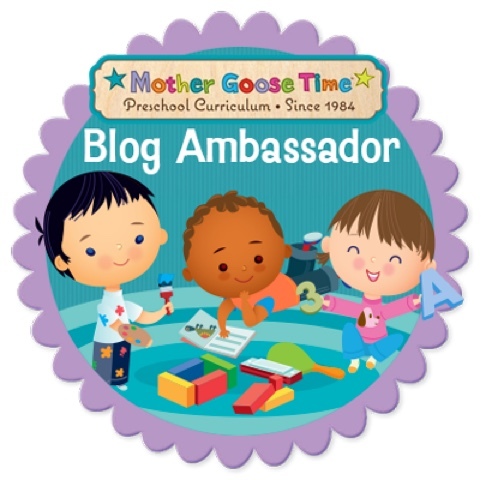 I'm very excited...Next week I'm going to share Mother Goose Time's assessment booklets and how I used them with my kiddos. It's going to be a busy week over here filled with more Food and Fitness and our usual homeschool/appointments/trying to stay sane life. Lots to look forward to and big things to celebrate!